1997 AQHA Incentive Fund nominated buckskin stallion. Standing at stud until sold. Call for price. This young stallion is a steal! All of you reining breeders should take a close look, you'll never find a better pedigree. You Quarter Pony breeders, you need this stallion. Want to be the next national reining champion? Pony Hunter breeders, you'll not find a finer mover. Don't let the superb breeding, movement, and quality of this young stallion scare you away. He is very reasonably priced and affordable to the farm that has the foresight to add an outstanding reining / cutting bred performance stallion of color to their 2004 lineup. Be the farm to make a name for yourself! Be the farm that breaks away from the competition! Call for price. You'll be surprised! You aren't going to want ANYONE to know what you paid! This fine animal is on consignment. "Braveheart" is line-bred "Atahi", and should mark his get with all of the outstanding traits Karen Griffith Farms has been working to achieve over the last thirty years. Make a name for yourself in the show ring and breeding world that others spend a lifetime attaining! A good investment for financial success at $25,500. Introductory breeding fee $500. K G MIRAGE - 1994 APHA chestnut and white tobiano stallion. Very fancy Pinto Colored Sport Pony! By "Halloween" (APHA sorrel and white overo stallion), out of "Sugar Blues" (APHA palomino and white tobiano mare - "Atahi's" full sister). There are not many horses born each year that have the ability to become a successful stallion. An animal needs that combination of flawless conformation, athletic ability, a trainable mind, and that intangible characteristic "charisma". "K G Mirage" has all of these qualities! He has beautiful coloring, the prettiest head and neck you'll ever see, is very refined while maintaining substantial bone, and has the very correct conformation and flowing movement to model. He should put a wonderful flowing stride and beautiful pinto markings on your fancy Pony Hunter,Quarter Pony, and Sport Pony mares! He stands 14 hands. His full sister "K G Masquerade", was always in the top ribbons on the Canadian, "A" large pony hunter circuit. "K G Mirage" is just as talented, and if anything, more beautiful! If you choose, he has a very bright future in the show ring. He has an even more brilliant future siring Champion Sport Ponies and "A" Circuit Hunter Pony winners. Mirage's beautiful pinto tobiano markings are just "icing" on the cake! Have "K G Mirage" sire your next Devon Champion! Fairly priced at $15,000. Breeding fee $500. DIXIE HEART - 1996 APHA dark bay and white tobiano stallion. By "Close To Heart" (APHA), out of "Skips Dixie" (APHA) - (Click for pedigree). If you're looking for an exquisitely marked, world caliber stallion, this is a fellow you really need to see! He is 65% dark bay and 35% white, with his color placed beautifully. He has a lovely head with a strongly pronounced jaw and a beautiful shallow mouth. His eyes are dark with a perfectly centered blaze. This young stallion's conformation is flawless! "Dixie Heart's" pedigree boasts countless World and National Champions on both sides! You've already heard a bit about his sire, "Close to Heart", and his outstanding working blood, but to top it off, his dam, "Skips Dixie" (a multiple Halter winner and great working mare), is an own daughter of the late, great Quarter Horse sire "Sir Raleigh"! 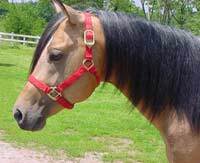 "Sir Raleigh" was the sire of multiple; AQHA World Champions (in both Halter and Performance), AQHA Champions, Superior Halter Horses, and Superior Performance Horses (in Western Pleasure, Hunter Under Saddle, Working Hunter, Pleasure Driving, Hunter Hack, Western Riding, and Trail). He sired countless Register Of Merit horses. "Sir Raleigh" was also the sire of "Skips Sierra Nick", the winner of the 'Copenhagen/Skoal Superhorse' award at the AQHA World Show. (A 13 page production record on "Sir Raleigh" is available upon request.) This outstanding stallion prospect is one of those few horses in the nation that really has the ability to sire winners in both the halter and a variety of performance classes. He should make an outstanding reining horse, with the great looks to "knock-the-socks-off" the judges, and the "cow-blood" to easily get his points in cutting or team penning. It's seldom you find all of these qualities in one package! Reasonably priced at $15,000. Introductory breeding fee $500.